What really moves Trump’s job approval? President Donald Trump’s approval rating has entered some dangerous territory if his intention is to get re-elected in 2020. Since mid-December, near the start of the government shutdown over border wall funding, to today, his average approval rating has witnessed its worst four-week period of decline since the start of his presidency. Trump’s disapproval number has jumped over four percentage points in just over four weeks (see Figure 1). This dynamic poses a significant problem for Trump. If he is to rebuild a winning electoral coalition in 2020, he’ll need a significant percentage of independents and weak partisans to return to the MAGA fold. In the era of hyper-partisan media, however, the evidence says this will be hard to accomplish. The rule-of-thumb is that an incumbent president’s job approval must be near 50 percent to have a chance at re-election. It’s not a perfect rule, but its seems to work. Figure 3 (from FiveThirtyEight.com) shows presidential job approval for all U.S. presidents from JFK to now. Both Jimmy Carter and George H.W. Bush were well under 50 percent approval just prior to losing their re-election bids. In contrast, Obama, Clinton, Reagan, Nixon and LBJ were near or above 50 percent prior to winning re-election. George H.W. Bush is the exception to the rule. If the 50-percent-rule holds today, it is difficult — but not impossible — to see how Trump can get re-elected given the erosion of his approval rating since December. He has never experienced an average approval rating over 47 percent, probably the bare minimum needed for re-election, and the path to get there would require a level of sustained approval growth he has yet to achieve. Through the first two years of the Trump presidency, his longest sustained approval growth occurred between December 2017 and June 2018 when his approval number rose an average of one percentage-point per month. That may represent Trump’s speed limit for any future approval growth. With 21 months until the general election, Trump has more than enough time to regain the public’s support. However, getting there won’t be easy. Figure 4 plots the weighted 4-week moving average of Trump’s average spread in job approval (Data from RealClearPolitics.com). 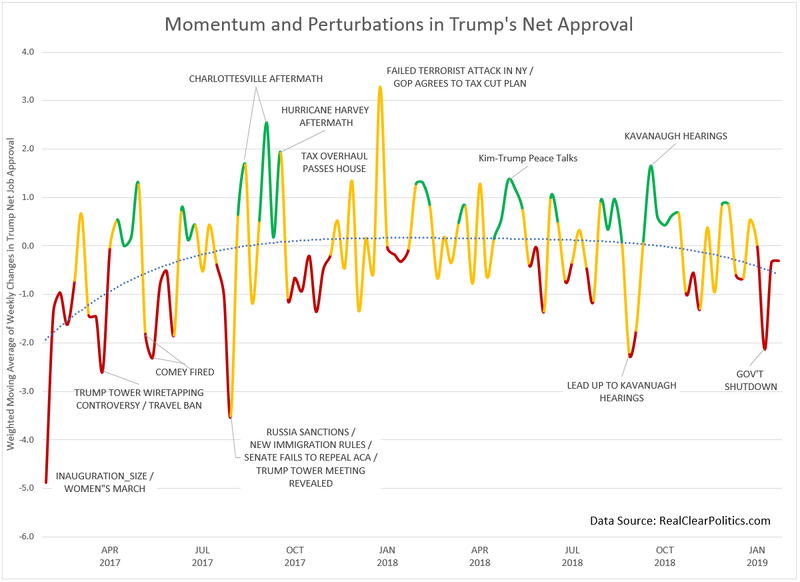 This diagnostic plot aims to highlight substantive momentum over noisier short-term changes while still showing the major shocks (‘events’) affecting job approval. 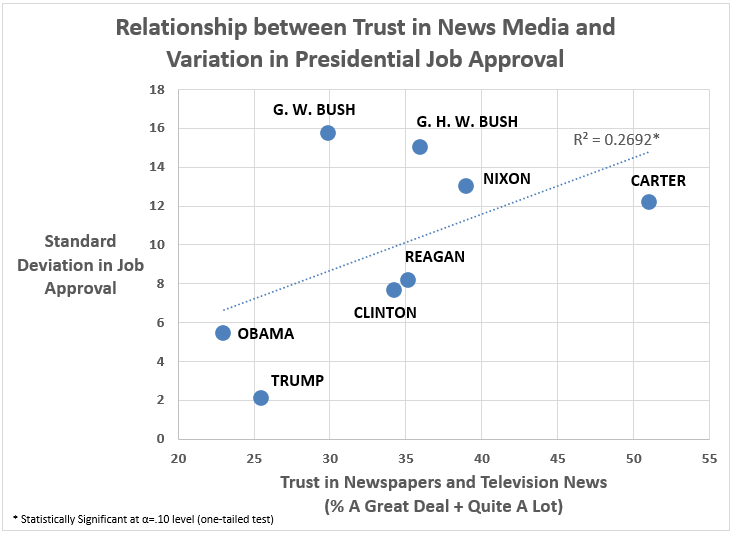 The chart’s baseline (zero) is an important threshold as it represents the point above which a president is successfully gaining public approval. Also notable in Figure 4, the color-coded lines represent periods of positive momentum (green), indeterminate periods (yellow) and negative momentum (red). The Trump presidency started in the hole. From the size-of-the-inauguration-crowd controversy, to the worldwide Women’s March, and the administration’s clumsy attempt at implementing a travel ban, Trump was underwater for all but one week during his first three months. In fact, he did not experience three consecutive weeks above the zero-threshold until the aftermath of the Charlottesville protests in August 2017. And his most sustained period of net approval growth occurred during the period leading up to the North Korea summit in June 2018 and the aftermath of the Kavanaugh hearings in the fall of 2018. The Charlottesville and Kavanaugh periods are interesting because the events themselves were highly partisan and contentious and the media’s coverage was uncommonly negative towards Trump (when isn’t it?). Both events moved Trump’s approval in a positive and consistent way. But why? The popular assumption is that these events rallied and galvanized Trump’s marginal supporters but did little to help him among independents. The evidence tentatively supports this conclusion. Among the nine percent of Americans that considered alt-right, neo-Nazi views as acceptable immediately following the Charlottesville protests (according to a Washington Post ABC poll), they were already Trump supporters. The shift in support towards Trump had to come from weak supporters and/or independents. Likewise, before and after the Kavanaugh hearings, the movement in Kavanaugh’s approval came from shifts among partisans, not so much from independents. “For the first time since Donald Trump entered the political fray, I find myself grateful that he’s in it… I’m grateful because Trump has not backed down in the face of the slipperiness, hypocrisy and dangerous standard-setting deployed by opponents of Brett Kavanaugh’s nomination to the Supreme Court. I’m grateful because ferocious and even crass obstinacy has its uses in life, and never more so than in the face of sly moral bullying. I’m grateful because he’s a big fat hammer fending off a razor-sharp dagger. In other words, the potential for Democrats to come across to Americans as bigger a**holes than Donald Trump is Trump’s Hail Mary-path to re-election. Assuming the White House is tracking these same movements in public approval, is it surprising that Trump continues to focus most of his policy and public actions around conservative red-meat issues such as illegal immigration? Along with the prospect of peace with North Korea, these are the only issues that move needle in his favor. Unfortunately, by continuously appealing to his base, Trump is doing little to expand beyond them. It is a strategy doomed to fail. Yet, Trump’s 2020 campaign manager, Brad Parscale, his 2016 digital campaign guru, continues to publicly claim his candidate is doing well according to their priority metrics going into the 2020 election. Parscale insists the public polls favoring Hillary Clinton over Trump prior to the 2016 election have proven their unreliability, as opposed to his internal data, which he claims has been near perfect. “Our data actually predicted 2016 results within one electoral (vote). In 2018 we predicted the results within a couple house seats and Senate seats perfectly. @realDonaldTrump outperformed in 2018 and we predicted that as well,” Parscale tweeted. But he is wrong about the inaccuracy of the 2016 national polls. Those polls, just before Election Day, showed that Clinton would win the popular vote by about 2 to 3 percent — which is exactly what happened. It was the lack of timely state-level polling that deceived the pundits. Despite Parscale’s public optimism, Trump is in very bad shape 21 months out from the 2020 election. 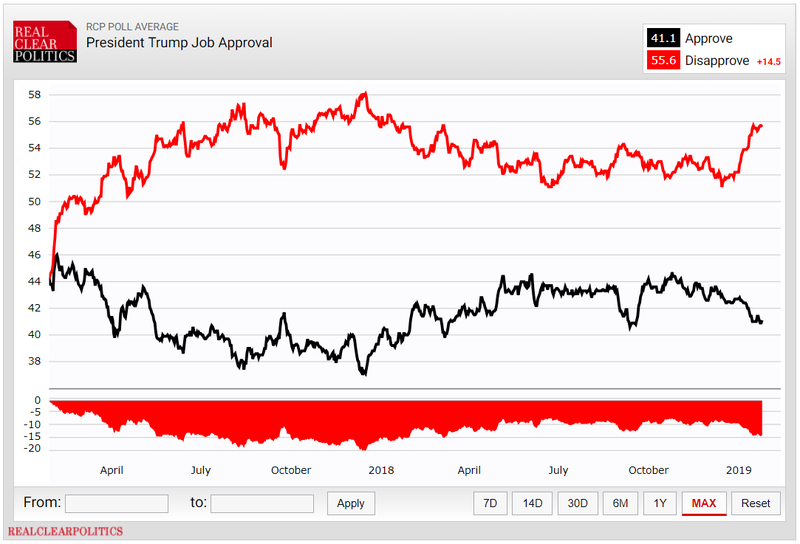 Trump’s long-term trend line in net approval slipped below zero a month before the 2018 midterms and has not since recovered. Indeed, the government shutdown has accelerated this ominous decline. Can the president recover? If his one percentage-point per month speed limit is accurate, yes, he has a puncher’s chance. But breaking through his 47-percent approval ceiling is more problematic and the early signs are not good. The lesson of the midterms, in my view, was fairly clear: Trump’s base isn’t enough. The 2018 midterms weren’t unique in the scale of Republican losses: losing 40 or 41 House seats is bad, but the president’s party usually does poorly at the midterms. Rather, it’s that these losses came on exceptionally high turnout of about 119 million voters, which is considerably closer to 2016’s presidential year turnout (139 million) than to the previous midterm in 2014 (83 million). Republicans did turn out in huge numbers for the midterms, but the Democratic base — which is larger than the Republican one — turned out also, and independent voters strongly backed Democratic candidates for the House. The GOP base is not enough for Trump’s re-election; certainly inadequate if the Democrats maintain their high motivation levels. Short of nominating Hillary Clinton again, almost any fresh-faced Democratic nominee will go into 2020 with higher favorability levels than Trump (I’m not sold on Joe Biden’s apparent reservoir of good feelings among Americans. The reality of a presidential campaign will bring him down substantially). And unless Trump can once again pull in a winning percentage of weak partisans and independents, he will lose in 2020…bigly.